When Iliad stormed the French mobile market in 2012, it grabbed nearly 32,000 customers every day in its first three months. By the end of its first quarter as France's fourth mobile operator, it had 2.6 million subscribers and an unprecedented 4% share of the market. Many analysts were left gobsmacked at its impact. The French mobile establishment was reeling. Yet Iliad appears to have done it again. Just 50 days after launching its Italian mobile offer, the new entrant claims to have landed 1 million subscribers. While its rate of growth does not quite match that in France six years ago, it still equates to about 20,000 customers per day and gives Iliad a 1.2% market share. In a country whose biggest telco generates less than €12 ($13.90) each month from a mobile customer, and where service providers had steeled themselves for Iliad's arrival, that looks impressive. The immediate outlook for Iliad's rivals is not pretty. In a research note published yesterday, Moody's predicts mobile service revenues at Telecom Italia (TIM), Vodafone Italy and Wind Tre will shrink by 4-6% annually in the next two years. With an introductory offer of €5.99 ($6.95) per month, Iliad is targeting price-conscious consumers. 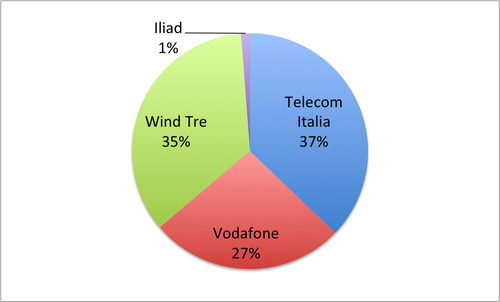 That means Wind Tre, which makes just €10.80 ($12.50) per month from an average customer, is more vulnerable than Telecom Italia (TIM) and Vodafone, which make €11.90 ($13.80) and €14.80 ($17.20) respectively. "Wind Tre and virtual operators competing in lower-cost segments will be hit the hardest by the tougher competition," said Laura Perez, a senior credit officer at Moody's. "Larger operators Telecom Italia and Vodafone are somewhat more insulated given their position in higher-end segments of the market and better-quality networks." Perez is forecasting an 8-9% annual decline in Wind Tre's mobile service revenues, to around €3.5 billion ($4.1 billion) next year. Its earnings before interest, tax, depreciation and amortization (EBITDA) will drop by 5-6%, as a consequence. For TIM and Vodafone, the decline in mobile service revenues is likely to be a more manageable 4-5%. Despite this fall, Perez thinks TIM's EBITDA will grow by up to 1%, and Vodafone's by 3-4%, thanks presumably to cost-cutting efforts. Is Iliad's campaign sustainable? The French operator says it will extend its €5.99 ($6.95) offer to its next 200,000 customers. That suggests prices will eventually start to rise as the customer base grows. But Iliad's profits have not suffered despite years of price-based competition in France, and it last year reported a high EBITDA margin of 35.6%. As far as Moody's is concerned, Iliad is likely to finish 2020 with a market share of 5-7%, making the next two or three years a painful experience for the old guard. But getting to a more "scalable" market share of more than 10%, as Iliad is targeting, will be a tall order for the new player. One problem it faces in Italy is its lack of a fixed broadband network. Unlike TIM, it cannot currently package up fixed and mobile services, and sell them for a single fee. That ability has been critical to Iliad's success in France. Even so, the shine has recently come off Iliad back home. In May, the company's share price fell 20% in a single day after it reported its first-ever decline in broadband customers, losing 19,000 in the January-to-March quarter. That dip, combined with disappointing sales figures, was a nasty jolt for investors who once thought Iliad could do no wrong. And for the Italian operators trying to cope with its arrival, it proves that Iliad can be hurt -- as difficult as that may be.